We were all delighted when the Institute of Oriental Studies, Russian Academy of Sciences, St. Petersburg Branch, offered at the Berlin Conference (see IDP News 5) to host the Fourth Preservation Conference. The Institute holds excellent manuscript and document collections of material from Dunhuang and elsewhere in Central Asia (see IDP News 2), with a particularly fine Tangut collection. Corresponding pictorial material is held at the Hermitage Museum, just a few hundred yards from the Institute on the banks of the River Neva. Moreover, and just as importantly, the scholars of the Institute enjoy an international reputation and we were delighted that many of them were able to attend and present papers at the conference. The proximity of the Institute and the Hermitage meant that it was possible to visit the impressive conservation studios and exhibition galleries of both. Russian hospitality was always present, especially in the reception hosted by the Head of the Manuscript Fund of the St. Petersburg Branch of the Institute for Oriental Studies, Professor Yu. A. Petrosyan. Dr M. I. Vorobyova-Destatovskaya worked very hard in organising the conference and IDP expresses its thanks to her, Professor Petrosyan and all their colleagues for making the conference such a success. The papers will be published in future issues of Manuscripta Orientalia (see below). Thanks are also extended to the European Science Foundation, Asia Committee, who generously funded the conference. Below is an abridged version of Professor Petrosyan and Dr. Vorobyova-Destatovskaya's report, the full version of which is carried in the IIAS Newsletter, No. 20. Above:The excavated stupa at Kharakhoto showing some of the Tangut statuary discovered there in 1909 by the Russian expedition. As planned, the conference devoted to the preservation of the materials discovered in the first quarter of this century by European, Russian, Chinese and Japanese scholars at the Mogao Caves (Dunhuang), in the ruined city of Kharakhoto, and in the oases of Eastern Turkestan (Turfan, Kucha, Khotan and others) was held between September 7-12, 1999 in St. Petersburg. Two insitutions joined forces to represent the cultural unity of Dunhuang and Central Asia in the first millennium AD in all its completeness. namely the St. Petersburg Branch of the Institute of Oriental Studies and the State Hermitage. The most important written sources - manuscripts and printed documents in old Indian, Iranian, Chinese, Tibetan, Uighur, Tokharian and Tangut - are held at the former, while the latter is the custodian of works of art found in the same region. These materials represent unique written evidence of political, cultural and religious history of the region an important part of the Silk Road. Once discovered, often buried among the desert sands, the materials had to be cleaned, conserved and brought to a condition to enable them to be studied. This work took more than eighty years and is not yet complete even now. The main task of scholars and conservators throughout the world is the preservation and dissemination of the materials and can only be accomplished by their joint efforts. The International Dunhuang Project was established with this aim in mind, and with curators and conservators from Dunhuang and other collections in Europe, Asia and the USA as members. The conference in St. Petersburg was the fourth in the series and attracted over fifty specialists from many centres. A focus of the conference was the general presentation by two participants, namely Dr Neville Agnew of the Getty Conservation Institute (see IDP News 13 for his report) and Dr. K. B. Kepping (Institute of Oriental Studies, St. Petersburg Branch). Dr Kepping spoke of the importance of the Kharakhoto stupa (see photograph above) discovered in 1909 by the Russian explorer, Colonel P. Z. Kozlov. This find opened the eyes of the world to the culture of the Tangut State (982-1227), which had been lost to world history despite it holding a position, argued Dr. Kepping, comparable to that of the Mayan Culture in the new world. Located between two empires, Tibet and China, this state remains something of a mystery, not least because of its sudden appearance as a formidable power, its brilliant but short period of prosperity, and its sudden fall. The special workshop session on paper was also a focal point, with interesting presentations from scholars and scientists in Kyoto who have analysed Dunhuang and Turfan papers. Dr Rischel of the National Museum of Denmark had prepared material for macroscopic analysis, bringing different types of restoration paper - Japanese, Chinese and European - and tables to help the participants count the laid and chain lines. These are characteristic of different types and periods of paper. Another workshop on restoration was opened with conservators from the Institute demonstrating the process of work on actual Tangut manuscript fragments. The work on small pieces of birch-bark was also demonstrated. The workshop then moved to the State Hermitage where the work of the paper, silk and mural restoration laboratories was introduced. The Laboratory for the Restoration of Murals was founded in 1948 and has 15 conservators. In 1996 it was awarded one of the main prizes - a gold scalpel - in the Second Competition on Restoration Values in Russia. The Laboratory for the Restoration of Oriental Paintings was only founded in 1998 and works on Chinese and Japanese scroll paintings on paper and silk, as well as album leaves, fans and screens, and Buddhist paintings on silk and hemp. The Database and Cataloguing workshop took place simultaneously and the participants were brought up-to-date on each other's work and agreed to embark on a joint project to produce a CD of Tokharian manuscripts scattered among different collections. The Conference showed that the two parts of the cultural heritage of Dunhuang and Central Asia - texts and artefacts - represent a single source of information and must be investigated without regard for disciplinary or national boundaries. Twenty-one reports were given and the most valuable papers will be published in the St. Petersburg journal Manuscripta Orientalia. This quarterly journal, written in English and printed and distributed from Helsinki, is already in its fifth year. Du Weisheng's paper from the National Library of China on the forms of stitching of Chinese manuscripts from Dunhuang (translated from Chinese by Colin Chinnery, The British Library) and that by L. I. Kriakin and O.S. Grigorieva about the restoration of the Tangut manuscripts from Kharakhoto (11th-12th centuries) will be published in volume 5 no. 4 (1999). The journal will thereafter published two or three papers per issue. Practical Session St. Petersburg Collection: Discussion of the Restoration Methods. Left:Francoise Cuisance and Monique Cohen of the Bibliothèque nationale de France. Melinex (polyethylene terephthalate (PET)) is now being used at the St. Petersburg studios and there was some discussion at the conference about whether or not it could be said to be inert. Some participants argued that glass remained the only truly proven conservation material for fragments. Of course, glass is also not an inert substance and there are now concerns about this and other problems associated with it (see below). However, there is no doubt that in many cases glass still has an important role to play in conservation. 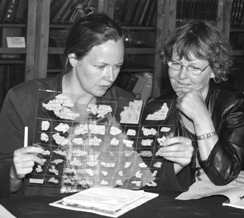 Left:Anna-Grethe Rischel (right), National Museum of Denmark, and Susan Whitfield, IDP, studying some of the fragments conserved in Melinex in St. Petersburg. On the question of Melinex, it was first patented in 1948 and has since been put to a variety of uses since which have demonstrated its long-term stability. Dr Barry Cope surveys Melinex and other plastic fibres used for binding document fragments in his survey article overleaf. The British Library Conservation section has recently approved a month-long study of Melinex using a variety of scientific techniques to be carried out with the Laboratory of the Government Chemist (LGC). This is part of the British Library's continuing programme of monitoring conservation materials in use at its studios. The results will be given in the next issue of IDP News. A joint project is also underway with Chris Collins, Conservator at the Geological Conservation Unit at the Department of Earth Sciences, University of Cambridge, and David Jacobs, Senior Conservator at the British Library to investigate and develop the use of oxygen-free storage systems for the re-housing of papyrus fragments in the British Library collection. The fragments are currently housed in glass, sealed with cloth or leather. However, despite refinements, the disadvantages of this system are obvious. If the item is dropped then the glass will crack or shatter with the papyrus. The papyrus is in direct contact with the glass, and changes in the environment are conducted through the glass to the papyrus. Fugitive inks and dyes can adhere to the glass, causing loss if the enclosure is opened. The papyrus is also held under an amount of stress and any expansion or contraction from hygroscopic properties that the fragments may retain is restricted by pressure from the glass enclosure. Contributions to this debate and, indeed, to any other aspect of conservation materials, are welcome and, if suitable, will be published in this section. Please contact IDP. This note addresses the problem of choice of a transparent material between sheets of which small documents might be trapped or laminated to conserve them while retaining their legibility. The conservation of documents by sealing them inside an envelope of plastic film obviously gives a lighter, less brittle and less bulky package for storage and handling than would be achieved by using glass. Glass is normally considered as being, if not strong and tough, then at least chemically stable. However, Boyd and Thompson point out in the relevant volume of the authoritative Kirk-Othmer's Encyclopedia of the Chemical Industry, that the durability and corrosion resistance of glasses vary dramatically with chemical composition. The requirements of plastic film are that it should be transparent, tough, durable, sealable by stitching, welding and bonding, and above all that it should in no way interact with the document and that its stability should be such that in long-term storage no ingredient or degradation product should leach from it and so be able to interact with the document. Four polymers are readily available in the form of robust flexible, transparent films. They are polyproplyene (PP), polyvinyl chloride (PVC), cellulose acetate (CA) and polyethylene terephthalate (PET). PP is cheap and is used to produce 'archival' storage sheets for the preservation and display of photographic slides. For this application, PP needs to be produced in such a thickness that it has a slight haze. The storage sheets are factory welded since the polymer is difficult to bond and to heat seal. PVC and CA are both old-established materials. PVC has virtually completely superseded the older CA for flexible sheet and film production, and the latter material is now used solely for fibres (the uncommon 'acetate rayon') and, more especially, as a filter material for cigarette tips. It should be noted that 'acetates' used on overhead projectors are now invariably made from PET. The related cellulose triacetate is used as a textile fibre (Ticel etc.) and as a photographic film base, but not as an independent film. Brody in Encyclopedia of Polymer Science and Engineering (2nd edition, vol. 10, p. 684f. ), reviews packaging films currently in use. Although he has an extensive section on PET, the only cellulosic materual he mentions in the thin film of regenerated and unplasticised cellulose, 'Cellophane', a material similar to the textile fibres, 'Viscose' and 'Cupra'. The main obstacle to the use of both CA and PVC as films is that they are, in their unblended state, rather stiff and hard at ambient temperatures and so must be softened by the incorporation of a liquid softener called a 'plasticiser'. Plasticised PVC sheeting is familiar though its uses in stationery binders, shower caps, garden hoses and the like. Serad (ibid. vol. 3, p. 158f. ), explains that cellulose esters are 'not used alone', that is, they must be plasticised. Successive editions of Brydson's Plastics Materials have treated the plasticisation of PVC in considerable depth. Sears and Touchette, Encyclopedia of Polymer Science and Engineering (Supplementary Volume, p. 568f. ), get to the root of the problem when they state that: 'because plasticiser molecules are not attached to the resin by primary bonds, the plasticiser may be lost by evaporation, migration or leaching.' There is, in fact, no such thing as a permanent plasticiser. All will bleed or exude to some extent over long periods of time leading to brittleness and surface tackiness. When PVC degrades through overheating or otherwise, it does so with the evolution of free hydrochloric acid, which in turn accelerates the degradation process and eventually leads to the development of a dark colour within the material. The degradation of CA has been investigated at Bradford University (UK) by Edwards and other (Polymer Dregradation of Stability 41 (1993), pp. 257-64 and Chemistry Review (September 1996), pp. 10-14) and at De Montfort University (UK) by Brown and myself (Brown, MSc thesis presented to De Montfort University 1998). Both groups agree that the initial cause of an accelerating breakdown of the polymer into a distorted and weeping state is the presence in the composition of a strong acid. PET is one of the most important polymers in current production. It may be processed to be strong, tough and transparent without the use of plasticisers. Indeed, its insolubility means that there are no suitable plasticisers. Although it was originally developed as a textile fibre and is still very important as such under trade names such as 'Terylene' and 'Dacron', it is also used in beverage bottles and as films. Film uses include drafting and other graphics film, photographic film base, magnetic recording tape and floppy disks, while other uses include drum skins, and the packaging of highly aromatic materials such as ground coffee. Trade names for PET include 'Melinex', 'Mylar', 'Hostaphan', 'Lumirror', 'Tetorn', 'Diafoil', 'Terphane' and 'Espet'. The use of PET in films has been established for many years: the original patent for this usage, British Patent 609797, dates from 1948, very shortly after the fibre patents, and thus there is plenty of evidence of long-term stability. Right:The flexibility of Melinex for securing even the tiniest fragments is shown here in an example of conservation carried out by Dr Nadia Brovenkho, St. Petersburg. This demonstrable stability combined with excellent transparency makes PET a clear choice for this application. PP is as yet unproven, shows some haze and may be difficult to seal, but is low in cost and should be very stable. It is worth submitting to trials. PVC and CA (and other related cellulose esrers) are likely to lose plasticiser and become brittle and tacky as well as possibly exuding acid. They are thus, and always have been, unsuitable choices for this application. PET is crystal clear and very strong and tough, as well as having excellent chemical stability and proven durability. PET would therefore seem to be the obvious material for the application. Dr. Barry Cope is Principal Lecturer in the Dept. of Chemistry, Faculty of Applied Sciences, De Montfort University, UK. The names of the leaders of the expeditions to Central Asia, such as Stein, Pelliot and Oldenburg, are well known and the activities of the expeditions are usually connected with their names. However, there were other members of these expeditions who, while carrying out important work, remain largely hidden in the shade of the main figures. In this article, Professor Menshikov considers one such figure. 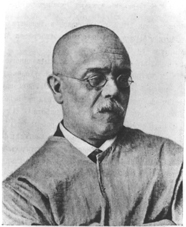 Samuil Martynovich Dudin (1863-1929) was a member of Oldenburg's two expeditions to Central Asia (Turfan in 1909-10 and Dunhuang in 1914-5). Usually mentioned as Oldenburg's assistant, he was in fact an active and independent member of both expeditions and his achievments should be recognized. Dudin was born in 1863 in Kherson District in the Southern Ukraine. His father was a village teacher and, like many other young people at that time, he became a member of a political group connected to the People's Liberty Revolution Party. He was arrested in 1884 and exiled in 1887 to Seleginsk in Zabaikal district, after which he abandoned his revolutionary activity for ever. While living in exile in Siberia he began to collect ethnographical materials (which he later gave to the local museum) and to study photography. In 1890 he joined the Orkhan expedition, led by W. W. Radov, and after his work there he was pardoned and allowed to return to St. Petersburg. Here he became a student in the Academy of Arts in the class of the famous painter I. Ye. Repin. In 1893 he started a job in the Anthropological and Ethnological Museum in which he remained until the end of his life (1929). At the same time, however, he worked in many other organisations connected to the Museum and was a member of several expeditions - such as that of Barthold in 1893 - and expedition leader of others (to the Ukraine in 1894; to Samarkand in 1895; to Kazakhstan in 1899; and again to Samarkand in 1905 and 1908). He produced an enormous amount of material from each expedition - photographs of the finds and sketches of ethnographical and archaeological objects. This material is now in the collections of many St. Petersburg museums, but is still only partially published. The photographs are especially interesting. In Dunhuang alone he took about 2,000 photographs, sketches and paintings. Many of these materials, classified by Dudin himself, have never been published. But this situation will change in the near future with the co-operation of the Shanghai Ancient Books Publishing House. In general ... S. M. [Dudin] was prepared to fulfill his task [his expedition work], even more so than myself. When I prepared my expedition account, I not only used his photographs, rubbings, drafts and other materials, but also repeated descriptions of many relics from his own records which were placed by him at my full disposal. This even included descriptions of relics seen by us both. The main object of S. M.'s thoughts was really the art. In his opinion, acceptance of a painter's work for the 'Itinerant Exhibition' [Au.. the realism school in Russian painting at the end of the 19th century] must be the first step on the path to fame, and he did not rate the ruling school of the Russian Academy of Arts [Au: classical painting]. When the 'Itinerant School' became prominent in the Academy he became a student of the famous studio of I. Ye. Repin. I remember that Academician W. W. Radlov was delighted with S. M.'s actions in choosing to continue of his own free will at the studio for over a year after finishing his formal education and receiving his degree. [Sborzik Museya Antropologii I Etnograthi 59 (1929)]. Samuil Martynovich Dudin holds a particular place in the history of Central Asian research. He was a perspective artist, attentive observer, archaeologist and ethnographer ... His large collections joined our museum's exhibition material and, at the same time, with his pen, pencil, brush and camera he created a most valuable and plentiful archive of extremely accurate reproductions of archaeological and ethnographical objects. Therefore, it is not an overstatement to assert that, without Dudin's materials, then many of the decisive results in Central Asian research would not have been made. [Sborzik Museya Antropologii I Etnograthi 59 (1929)]. Samuil Martynovich Dudin dedciated a large number of his works to the Ethnographical Department, especially in its early days. Samuil Martynovich was the first gatherer of material for the Department, and between 1900 and 1909 he devoted his efforts to collect archaeological, ethnographical and photographic records of the peoples of Central Asia, including the Turks, Uzbeks and Kirghiz. His collection therefore became the Department's scientific foundation. Afterwards he remained unchanging in his willingness to help the Department at any time, and to share his considerable museum experience. Professor L. N. Menshikov is a specialist on the Russian Central Asian materials at the Institute of Oriental Studies, St. Petersburg Branch., Russian Academy of Sciences. Shanghai Lexicographical Publishing House, 1998. This is the first dictionary for the specialized field of Dunhuang studies written mainly by Chinese experts in the field. There are more than 6900 entries, 700 illustrations and 10 appendices, covering all fields of Dunhuang study. An invaluable reference work. For details contact the publisher. This 28 volume set is arranged thematically, 'Painted Statues', 'Paintings of Jataka Stories' etc. Those interested should contact: Ms Tess Lam for further details. Berliner Turfantexte 20, Berlin-Brandenburgische Akademie der Wissenschaften Akademienvorhaben Turfanforschung. A full-colour catalogue in English and Chinese of the The Queens Borough Public Library, New York, (see below). The catalogue includes about 180 color plates, full descriptive essays for every object in the exhibition, notes and references pertaining to each work, and an extensive bibliography listing more than a century of monographs, articles, exhibition catalogues, and reference works related to the exhibits. For ordering details contact Paragon Books web site. The result of five years research and writing by its authors, who decided to write the book during a visit to the Kyber Pass in 1990. SDI Publications are bringing out a series of reprints of classic texts. A selection of the titles to be published are listed below. Supplied note: 'A new [Ed. so far only 1(1) issue was published] journal seeking to strengthen understanding of the history, politics, economies and cultures of Inner Asia. Its concern is to be interdisciplinary and inclusive, the better to reflect diverse, indigenous and critical understandings. The conference is scheduled to last six days, the first four days for papers and discussion and the last two days to include visits to the Mogao caves, Yulin caves, West Qianfodong, Yumen Pass and the Han dynasty Great Wall. Spaces are limited to 170 delegates. Participants will be expected to pay a registration fee (which includes local travel for the cave visits), travel to and from Dunhuang, accommodation and other expenses. Further details will be sent with the second announcement in August. 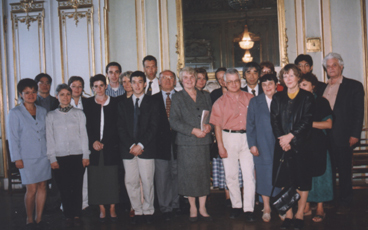 In continuation of the last Dunhuang - Turfan Symposium, held with great success as part of the 35th ICANAS in Budapest 1997, we would like to invite you to take an active part in the next symposium to be held in Montreal 2000. Please send your paper or panel proposals to any of the organisers as soon as possible. The symposium is part of the 36th ICANAS and participants will be expected to register for this and will receive all general details from the ICANAS organising committee. A second circular and further details will be sent after the preliminary programme of the symposium has been fixed. A landmark exhibition of more than 70 objects from the National Library of China, Beijing, 'Visible Traces' was on view to March 15, 2000 at The Queens Borough Public Library, New York. It then travelled to the Los Angeles Public Library in Spring 2000 (April 15-June 25, 2000). The exhibition is divided into 4 main sections: 'Rare Books and Manuscripts', 'Epigraphical and Pictorial Rubbings', 'Maps and Atlases', and 'Texts and Illustrations from China's Ethnic Minorities.' Among the highlights of the exhibition are a Tang-dynasty Dunhuang manuscript of the Lotus Sutra dated 695; a scroll from the famous Jin-dynasty Tripitaka printed between 1149 and 1173 and deposited at Guangsheng Temple in Zhaocheng, Shanxi; a volume from the Collected Works of Ouyang Xiu printed in 1196 during the Southern Song period; a volume from the Yuan-dynasty edition of the Sheng ji zonglu, a medical encyclopaedia, which was printed between 1299 and 1300. There is an exhibition catalogue (see Publications) and a symposium was held on February 19, 2000. This inaugural exhibition of the Museum of Cultures is the most comprehensive ever of Asian materials gathered by Carl Gustaf Emil Mannerheim (1967-1951) during his 1906-8 Central Asian expedition. The present exhibition features a thousand ethnographical items, antiquities and texts, a thousand high-quality photographs, and some of his maps, sketches and diary entries. The exhibition runs until the end of 2000 at Finland's premier ethnographic museum, established in November 1998. Professor Hao Chunwen, Beijing Capital Normal University, is currently working at the British Library on transcriptions of non-Buddhist manuscripts. He arrived in September 1999 and will stay for a year. His work will be incorporated into the IDP database and also published in China. It is part of an ambitious project to make transcriptions of all the Dunhuang documents. Dr Li Jinxiu from the Institute of History, Chinese Academy of Social Sciences, received a K. C. Wong Fellowship to work at the British Library on the Dunhuang manuscripts for four months from November 1999. Visitors from the Ministry of Culture in China were shown the work of the International Dunhuang Project during a recent visit to the UK. Work has started on cataloguing of the Tangut material in the British Library. Stein visited Kharakhoto after the Russian Kozlov expedition had been there and made the discovery of manuscripts,printed documents and paintings in a stupa. Stein's material does not therefore compare in splendour or completeness with the Russian collection, although there is some interesting illustrated printed material (now in National Museum, New Delhi).The collection in the British Library consists of over 4,000 fragments, both manuscript and printed, as well as a few complete scrolls. There is also a certain amount of material which is very fragmentary and which is currently undergoing conservation. We were very pleased that Dr Ksenia Kepping from the Institute of Oriental Studies, St. Petersburg branch, agreed to work on this material. Further details of progress will be carried in forthcoming newsletters. The searches on the IDP Interactive Web Database have been made considerably faster. In addition, the specific search has been upgraded to make searches possible by any published catalogue number as well as library pressmark and Stein site number. The Hungarian participants are Dr Eva Apor (project leader), Agnes Kelecsenyi, Mrs P. Balazs, Dr M. Karteszi, all at the Library of the Hungarian Academy of Sciences. The UK participants are Helen Wang (project leader, British Museum), Susan Whitfield (British Library), John Falconer (British Library), Tim Rogers (Bodleian Library), Lilla Russell-Smith (CIAA, SOAS).